RTA cabinets: Is the quality there? RTA cabinets come in a growing array of styles and finishes. The primary advantages of these cabinets is their ability to be shipped to a job site and assembled on-site. There are several things to consider when purchasing cabinets and one of them is the durability of the surface. Kitchen cabinets are constantly getting dirty. The surface needs to be durable enough to handle detergents and damp wipes for years. The hardware is another feature that is going to need to be both practical and attractive. The pull hardware is especially important in terms of its ability to be strong and easily cleanable. Drawer runners are the operating part of cabinets that can really make or break your experience using them. Following is a photo of a solid maple RTA cabinet with a cherry finish. The homeowners were VERY pleased, both with the price and the quality. A drawer in a kitchen gets constant use, so it's very important it operates properly. Ball-bearing drawer guides are the best solution for a smoothly operating drawer. Ball bearings come in two types, one with synthetic balls and one with steel balls. As you might guess, the steel balls last longer and are less likely to develop flat spots over time. The joinery used is another area to look at. There are typically two types: one is a basic glue and staple, and the other is dove tailing. The basic glue and staple is simply bringing the two pieces together and applying glue and a few small staples to hold it together. This is a quick and dirty method--literally. These joints have more of a tendency to fail over time. The constant pulling and pushing a drawer takes eventually loosens these joints and the drawer will twist and bind. Additionally, as the joint loosens, it will create small gaps that will capture food and debris this will be next to impossible to clean. Dove tailing is a much better method. This method is done by cutting interlocking "fingers" in each board from top to bottom. These fingers are then joined together to form a solid, sturdy joint that will last for years. There are many manufacturers making RTA cabinets and the quality varies greatly. As with all purchases, you need to do your homework before you buy to ensure that you get the best cabinet for your needs. 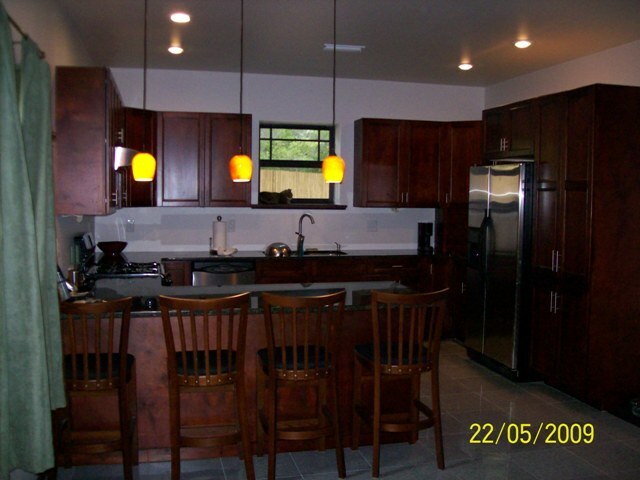 Learn more about ready to assemble kitchen cabinets. Go to the Home Page from RTA cabinets.